March is here! Seems like it was just yesterday we were fawning over the new Pantone color of the year. Yet, 2014 is “marching” ahead as spring awaits around the corner. Looking to freshen up your room with some seasonal design ideas? 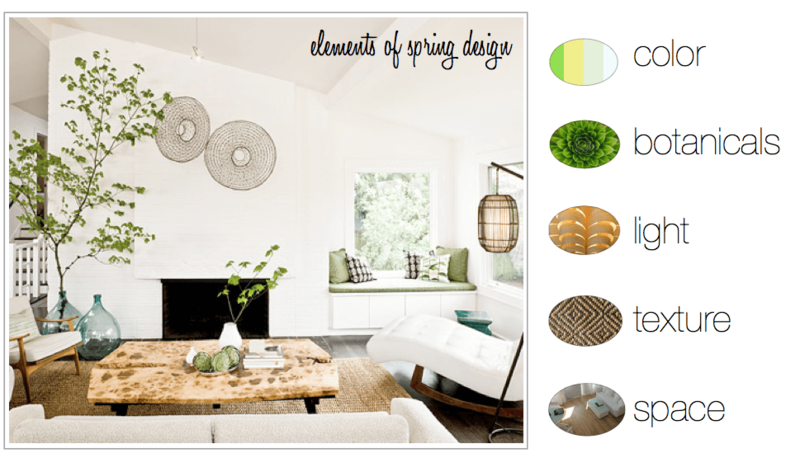 This beautiful living room inspires an example of a Spring look. Being mindful of various elements that make up a well designed room, you can transform your space with some small changes. The palette in the room shown is crisp and airy. By using neutrals, the shades of green are highlighted which offer coolness and an essence of the outdoors. What a great way to sense spring’s arrival. Along with Pantone’s announced color of the year, Radiant Orchid, there are several other gorgeous colors to consider this spring. Whether it’s simply changing throw pillows or adding an accent wall color, introducing a fresh palette will certainly give your room a change. Plants and flowers go a long way in design. They bring the outdoors inside, offering natural beauty and a sense of vivacity. Experiment with a tall tree plant near a window or decorate a surface with interesting terrariums. Have a tendency to shorten plant life spans ? Try out air plants; they are extremely low maintenance and come in unique shapes and sizes. Introducing a good lighting plan in your room makes all the difference in the mood of a space. Observe how the lighting in your room makes you feel. A space welcoming natural light is healthy and uplifting. Select window treatments that give you varying options, a double curtain combo of sheers and an outer silk or cotton offers this. Not many windows in your room? No matter. Find interesting table or floor lamps that express your style and allow in a lot of light (look for lightly colored shades). For inspiration, check out Layla Grace’s new line of table lamps-beautifully detailed bases and shades. Color and form help diversify a room design, but so does texture. Having different tactile elements adds subtle interest to a space. For the spring season, consider natural textiles that breathe like cotton and linen. 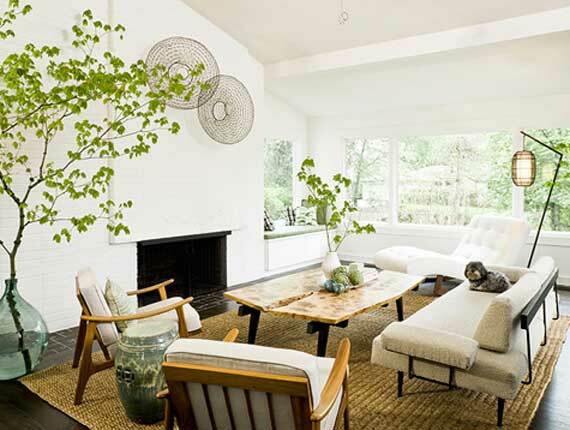 Introduce a woven bamboo or jute rug for a change. Spring cleaning is a great excuse to get rid of clutter and organize your space a bit. Take inventory of the furniture pieces in your room and ask yourself if they are used well or if they just take up space. A good furniture layout plan can offer an effective and comfortable design that gives a sense of openness. Not sure where to start? Upload photos and let our Decorilla designers share various design ideas with you. Written by Christine Martin, Decorilla’s Creative Design Expert. You can check out her gorgeous designer profile here.